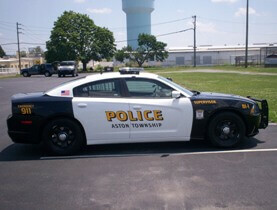 The Aston Township Police Department consists of eighteen (18) full time officers, including the Chief of Police, and seven (7) part-time officers. The Department is an integral part of the community and is dedicated to protecting and teaching our community how to be safe. We rely heavily on cooperation from our citizens and business owners to help us protect the community. If you see or hear anything suspicious or find another person in danger or need of help, call 911 immediately to notify Police. Crime Prevention is everyone’s responsibility!